WELCOME TO OUR INDOOR SECTION! Do your kids need somewhere to run around and burn off some steam? 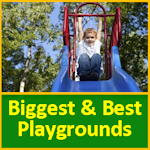 Check out the map below and the corresponding write-ups that review great indoor playgrounds, places to play and museums. Got a good place to share? Let us know! Here’s our current Review List!! Let’s face it, we’d love to take our kids to great playspaces everyday, but that can get expensive, especially in NJ. Besides our Free Places to Play listings, I’ve found that there are great places to go (or join) without having to spend any money. Libraries- Check them out, some have great areas for kids to do puzzles and computer games geared toward ages 3-6. Ours in Springfield has a great storytime. They also have resources to publications geared for local family activities (Kids guide, ____county family guide, flyers, etc.). I’ve heard very positive reviews for the library in Chatham as well. Barnes & Nobles– Very kid-friendly. Barnes and Noble (Paramus, NJ) (thanks ira from city-data) and in Clark, NJ both have train tables for kids to play with. Definitely recommended! Menlo Park, Edison, NJ also has a train table (thanks Bob K. from city-data). Rumor has it that Riverside Square Mall does not have it anymore. Restaurants/Cafes- Well, not necessarily free, but some are kid-friendly, I’ll need your help to find some of these. A very popular one I had visited had closed recently in South Orange. Yeah I know, completely useless bullet point. Help a momma out, share your favorite cafe to hang out with the kids, I’m beginning to think they don’t exist in NJ. McDonalds Playlands– McDonalds has made strides to have more nutritious choices for kids, and they also have some fun equipment. Check out their site for which ones have playlands. Gym- ok really not free, but once you join, many of these places have babysitting and the kids can enjoy a change of pace. For example, I go to Connection in Summit (sorta like a YMCA). I volunteer and am a member at the gym, the babysitting there is friendly and will even hang out there for a little bit, using their playground outside their area. Comment below if you have a new place to share, we will add it to our map! Thanks for checking us out. If you have an indoor place we haven’t covered let us know!!! Surprised not to see Clown Around in Flanders listed. Has open play multiple times per week (specializes in birthday parties). Very clean indoor play place for kids under age 7. We always have a great time there! Baby Power Forever Kids has open gym times for member and non members. Please check the web site for schedule and prices. Great for children 6 months – 5 years. What is the website Miss Lois? Am looking for a place to hold my son’s 2nd birthday. Any suggestions? Thanks in advance! Hi. First of all, thank you for creating this wonderful site. We just moved to NJ from Texas about 6 weeks ago and your site is helping us find fun indoor places to visit. I wanted to add 2 that we have fun in. Chick Fil A in Hamilton, NJ is a delicious fast food restaurant with nice clean play area. Also Pump-It-Up in Hamilton! NJ. Fun, fun, fun bouncing n jumping open play several days of the week. Great for birthday parties. And one that has been around a while, but not sure if it is still open: space odessy 2000 in Englewood, NJ. I love this site! Thanks for sharing and making our family life richer!!! 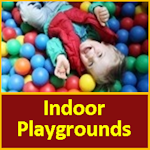 A great new children’s indoor play center has just opened in Andover, NJ. It’s easy to get to and offers a huge indoor climbing structure, open play space, boy and girl themed play room and a safe toddler play area. It also has an awesome 50’s themed diner and an adorable grocery store, both kid sized down to the shopping carts and chrome diner stools. They also have two huge party rooms and will do all the hard work for busy parents. Check it out! Don’t forget Grandslam on Oak Tree Rd. Edison. There is even a coupon in the Kid Stuff book for the playscape. There is a bouncy house place with the Disney Characters on it in Nortvale, NJ called Jumping Bean. Ammy, there’s Kidville in Englewood, but I think you have to be a member first. I heard another place in opening in Englewood, something like Jump U on Grand or Broad Avenue and I think it’s going to be drop in. There used to be another playspace in Englewood called Cutie Patooties that was pay as you go – they say they closed to relocate, but I haven’t heard anything since that happened a couple of months ago. I’m all the way up in north of the county, and if you’re willing to take a little drive up the river to just over the state line into Rockland with them, there’s a pretty good one called The Playroom in Nyack for their age which is drop-in. http://www.theplayroomnyack.com. Another one in that ares is called Wee Play in Nanuet, but when it’s a rainy day it gets crowded and the place is a zoo! Also in Bergen County try Bounce U in Paramus which has open play schedule. And there’s also Jump On In in Hasbrouck Heights. Good luck! Great huge place in Hackettstown, All Play. Bounce stuff and lots of pretend structures, ride on stuff, etc. Closed Mondays but open play almost everyday. Theres also the free playgrounds in ikea – and the childrens section has little play area too. We love local nature centers – tenafly and flat rock (englewood.). They both have indoor kid spaces with animals, books and toys. Last time we were at tenafly nature center, the volunteer got out all the animals and let my kids hold them. It was great – and very educational. We went to Jersey Gardens on August 30th, 2013, the indoor playground was demolished, so they don’t have any place for kids to play indoor any more for now. Does anyone know of any good indoor play centers for toddlers near Hunterdon County? 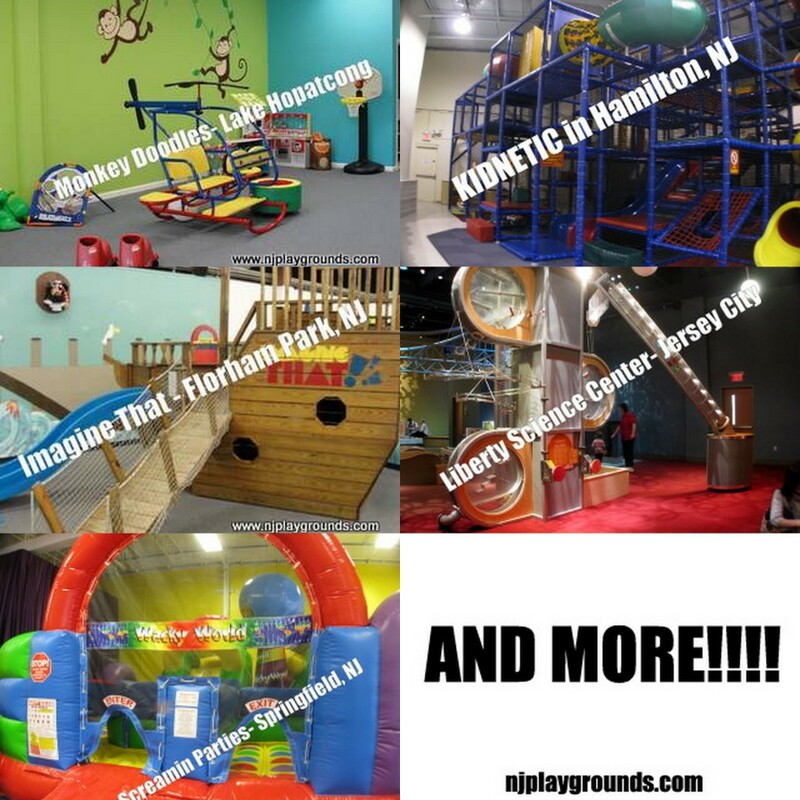 Kid Junction in Branchburg recently closed and I can not find anything local. Riverside Kids Gym in Mansfield/Hackettstown, NJ has Open Gym hours every weekday. Indoor gym sessions offer supervised open play with no reservations or memberships needed. Riverside Kids has full size equipment such as bars and balance beam as well as a turf area that is sometimes available for sports activities. If your child loves to climb, balance, jump and swing then they would enjoy their time in Open Gym! Payment is by the hour: $6/members; $7/ non members. Kid Junction in Branchburg has been closed for over a year now. Such a shame as there isn’t any good indoor play places in Hunterdon county. How about places for 2 year old to go during winter around Margate, NJ (south jersey). I am desperate. In response to Paula’s “plea”- I used to live in Linwood, and took my little one to Bright Stars in EHT. It is very clean and safe. They offer many classes for kids which are excellent (both my young one and middle schooler took classes there), but they offered open play, pay as you go, three days a week. Very reasonable pricing, staff member present in gym area, tons of space and equipment. I remember that one day was pretty crowded, but other than that it was great. I moved to north Jersey about 3 years ago so I’m not sure about the open play. I know they are still there – as I said, they had a great gymnastics program and the owner is really caring and definitely “knows her stuff”. Check it out! In the center of Ocean County is Play Day Place. They have a bunch of cool stuff and even go as young as 1 year olds. And they actually have stuff for the young ones and the older kids. I have 4 kids of different ages and they play there for hours. Bounce houses, rock climbing, virtual game mat and a Velcro wall. In Paramus on Route 17, they have opened “The Arena” which is a playspace to practice sports and can be rented out for birthday parties.